I’ve worn some version of this outfit too many times since I purchased this dress in September. It’s the ideal transitional weight for London weather, and thin enough to layer under other sweaters, vests, and coats. Plus, this dress is super soft and only $40! My favorite way to wear it though, is with this embroidered faux fur vest I found at Topshop my first week here. Because it didn’t get really chilly until about a week ago, I had to wait to wear it. I love how this dress really elevates the vest for a seamless day-to-night ensemble. If you’re following me on Instagram, you’ll know I landed in Vienna yesterday! I’m excited to spend the next three days exploring all Austria has to offer – I’ve never been here before, so I’ll be taking tons of photos. Make sure you’re keeping up with my Snapchat too (username: merrittbeck) for behind-the-scenes action! Have a great time in Vienna! I really like that vest! Have a great time in Vienna! That dress looks like the perfect layering piece! You look so classy! Such a fun look with that vest! Love this look! Think I may need to snag that dress. Loving your snaps from Vienna! That dress is so cute and versatile! I love the way you styled it with that faux fur vest because it makes you look very sophisticated. Love this vest! You look gorgeous! Love that vest. For some reason this season I’m a bit obsessed with vests…I just got a black faux fur one from Club Monaco that I feel like you’d love as well! 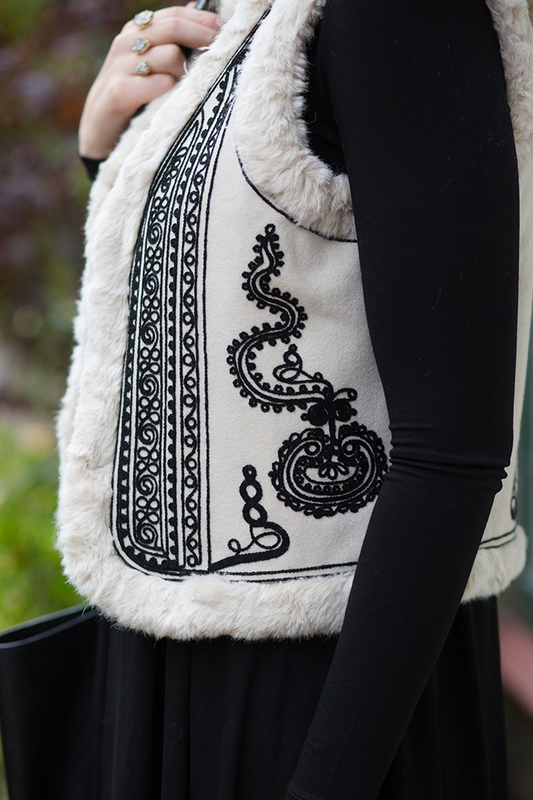 I love a cozy vest especially one as chic as this! Also loving that you kept the rest of this look simple. I think it’s finally time I invested in a pair of Wolford tights. I’ve heard they’re the best!